Keynav makes your keyboard a fast mouse cursor mover. You can move the cursor to any point on the screen with a few key strokes. It also simulates mouse click. You can do everything mouse can do with a keyboard. 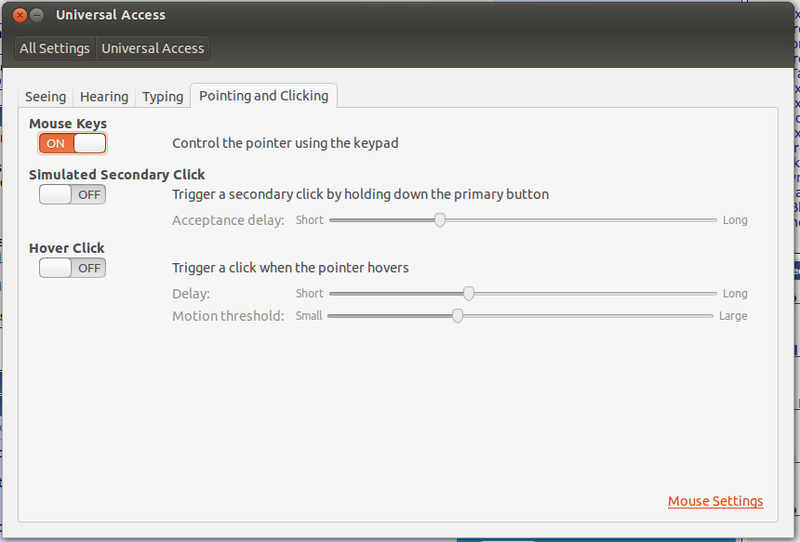 Gizmod is a utility for enabling alternative input devices to be used in Linux. This includes such devices as the PowerMate USB dial, fancy keyboards and mice with buttons not recognized or supported by X. Gizmod allows per application event mappings. Of course you can play with the values as necessary. Solved it straight away. Hope this helps someone in future. which I've been gratefully using for donkey's years. An other handy option is using any game controller mapped with xboxdrv to your convenience. After all I found an add-on for firefox named VimFx and one for chrome named Vimium. You can do a lot without mouse, easily. Here are its shortcuts, that if you are a vim user, then most of them you already know! Not the answer you're looking for? Browse other questions tagged shortcut-keys mouse browser or ask your own question. regain control of mouse by restarting Xorg? Is it possible for a double mouse middle click to activate the overview?